One of my last games (currently) from Days of Wonder that I need to review is Pirate's Cove . In Pirate's Cove, each of the players takes on the role of a pirate, and the goal is to gain the most fame. Each turn, there will be 5 outer islands which will have various rewards for successfully exploring there - however, if you encounter another pirate at that island, you will have to fight it out, and only the last person at the island will get the treasures. Once you have all collected your treasure (or been defeated in battle and forced to flee to another island to repair your ship), then you are able to upgrade your ship. Your ship has 4 stats on it: sail (how fast you are and so who shoots first in battle), cannons, crew (cannons and crew work together to determine how many shots you can fire), and hull (how much treasure you can carry). However, you can only upgrade the stat for the island that you have explored this turn - there is an "outer island" for each stat, plus an island that lets you draw "tavern" cards and Treasure Island in the center where you bury treasure to gain fame. Another thing to watch out for as you are exploring is the dread pirates - these pirates represent already powerful and famous pirates, like Captain Hook and Blackbeard, who will fight you if they wind up at the same island as you. Overall, Pirate's Cove has a lot of great aspects. First, it is one of the best implementations of Days of Wonder's formula of making games that are engaging enough for a gamer but simple enough to easily bring in a non-gamer. I have played Pirate's Cove with groups of gamers, non-gamers, and a mix of both, and it has played very well with both. The next thing I like about Pirate's Cove is that you actually have control over what is going on in the game - whether you encounter other players is based on whether you both choose the same island to explore in a turn (revealed at the same time). This means that if you are able to read people's tendencies then you will be able to more easily determine which island they might be going to and go there or avoid it depending on whether you want to fight them or not. Also, since they have removed any concept of "transit time" between the islands, the game is very fast paced so that it can focus on things other than sailing. A third aspect to mention about Pirate's Cove is both a pro and a con - the battle system. When battling another pirate, you will first determine the fastest player at the start of each round. After this, in speed order, you will each declare who you are attacking, and which part of their ship you are firing on. Then, for each crew/cannon combination you have, you will roll a die, hitting on 5's and 6's. The pirate you fired on will immediately take damage, and if they are damaged beyond a certain threshold they will retreat (before firing again). This works very well except for the die rolling. The die rolling (as it is in lots of games with dice and chance) causes this experience to be very frustrating sometimes - you may have your opponent completely out-manned and out-gunned, but when you roll all low numbers and they roll all 6's, there's absolutely nothing you can do about it. Adding more to the luck element of the game are the "tavern" cards. You can earn or buy these cards in various ways, and they are all useful in the right situation. However, there are 4 cards (representing the parrots of famous pirates) that are much more powerful than any of the other cards in the game. This is great if you draw one, but is frustrating if your opponent draws one at the wrong time. Overall, I give Pirate's Cove a 9.0/10. It is by far the best pirate game I have ever played (defeating at a minimum: Sword & Skulls, Dread Pirate, and the constructable mini's game). A note about this game, however, is that you need to go into it realizing that if you have bad luck in the game, this will defeat even the most sound of strategies.With that said - this is one of very few games that I have seen in which almost all of the players enjoy simply playing the game, regardless of whether they are winning or losing (after all, it becomes amusing after a while if you cannot hit the broad side of a barn with your cannons). As a final note, I will mention a variant of the game which I enjoy. 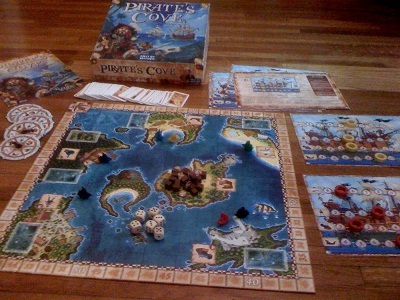 The standard rules suggest that you play with 1 or 2 dread pirates depending on the number of players in the game, and then move the pirates around the islands in ascending order. I prefer to randomly pick 2 dread pirates (that have not been defeated/killed) each turn and then roll the dice to determine which island they are going to - after the players decide where they are going. This prevents them from simply running away from the pirates all game, even though it adds even more of an element of luck. If Pirate's Cove sounds interesting, you might also check out Cargo Noir, King of Tokyo, and Dixit (a storytelling game).